Vector 275 has been been published. It has my review of Hannu Rajaniemi’s The Fractal Prince and Dan Hartland’s review of The Eye With Which The Universe Beholds Itself. You can find a full list of the books reviewed here. This issue has the Vector reviewers’ summation of 2013. I decided to skip this year as I would have had to discuss my involvement with the British Fantasy Awards, which didn’t seem fair on the other jurors or the shortlisted authors. And not mentioning them in my summation of 2013 would have been equally problematic. There are also articles from David Hering, Molly Cobb, Laura Sneddon, Tony Jones, Stephen Baxter, Andy Sawyer and Paul Kincaid. 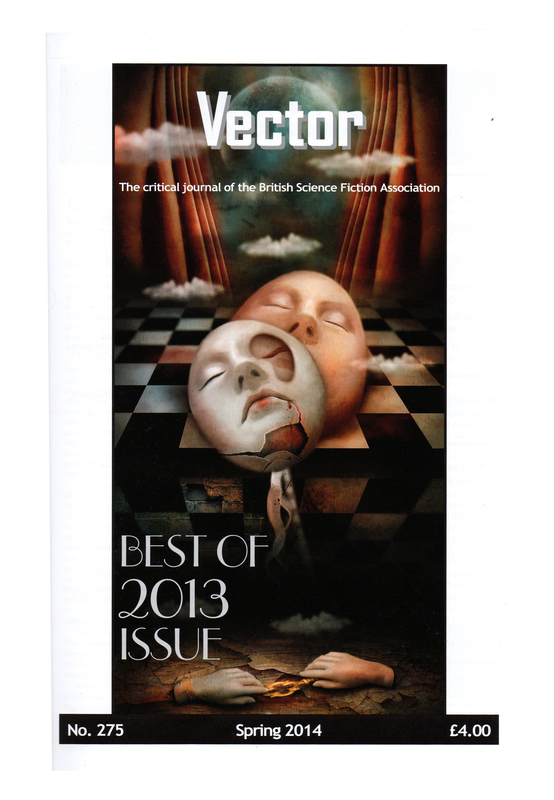 BSFA members will have found that their issue mailed out with BSFA Awards 2013. This volume contains the shortlisted short fiction from Nina Allan, Sofia Samatar, E.J. Swift and Tori Truslow; shortlisted non-fiction from Liz Bourke, John J. Johnston and Jeff VanderMeer; and artwork from Joey Hi-Fi, Kevin Tong and Richard Wagner. This entry was posted on Wednesday, April 2nd, 2014 at 12:27 pm and is filed under BSFA, Editor. You can follow any responses to this entry through the RSS 2.0 feed. You can leave a response, or trackback from your own site.